I'm a dummy, are you? 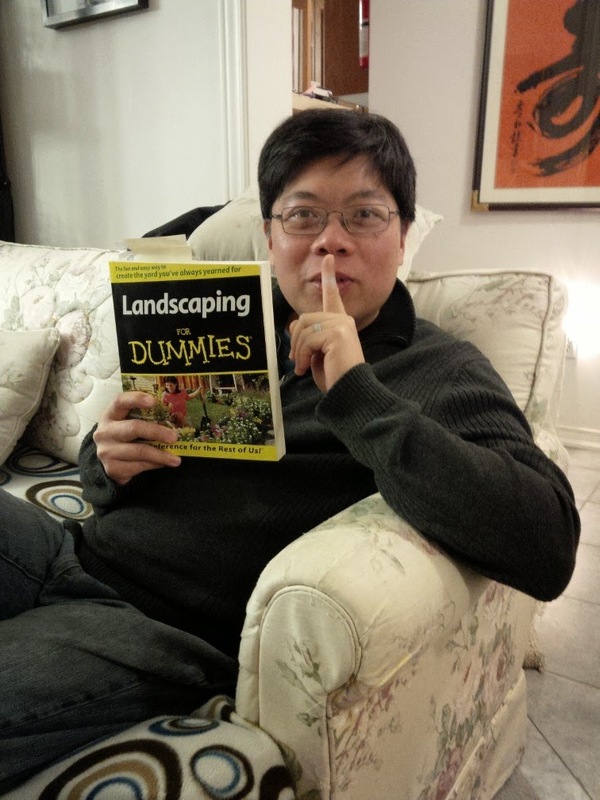 I was celebrating a birthday party at my brother-in-law's place and I happened to come upon "Landscaping for Dummies" lying nearby. Browsing through this very useful and accessible book with its readily identifiable black and yellow cover, I thought about my own education of gardening, horticulture, botany, landscape design and other plant-related topics. Maybe it's due to writing this post in late December but around this time, I usually think about the year that's ending to remember what I've learned about gardening, my business and, most importantly, about myself. And year after year, I've always remarked "boy, what a dummy you are!" I think being inquisitive and a voracious reader helps with this once ego-bruising self-reflective exercise. As a by-product of creating my gardening business from nothing but a concept and running it alone for almost ten years, I've been forced to learn about the exciting areas of marketing, sales and client services (and don't get me started with accounting!) This isn't a post on entrepreneurship (although that would be interesting for the very few readers who have their own businesses or are thinking of creating them); rather, I'm writing about how the lessons of lifelong learning, making mistakes, and admitting ignorance often written as advantages in many business books can also be translated to gardening. do you strive to ask questions and seek answers about what happens in your garden? do you accept making mistakes easily and without a lot of soul-searching when you garden? do you admit that there's a vast amount of knowledge (botanical, horticultural, whatever) out there waiting to be discovered, evaluated and often discarded? Seriously, I've read this book from cover to cover dozens of time. It's no wonder I love perennials due to this great resource as the author isn't shy about describing a particular genus' strengths and failings. Residential Landscape Architecture: Design Process for the Private Residence was the required text for my college Landscape Design course and introduced me to the process of creating functional landscapes. One bonus is that the text is very readable to a dummy like me! Known as simply "the Manual", Dirr's classic got me through two years of Plant Identification classes and beyond. The author's breadth of knowledge and horticulturally-snippy comments are worth the effort of carrying this door-stop of a reference book. You'll feel like a big time dummy after working from A-Z of Dirr's magnum opus. in and outside of the garden. So for the few dozen readers out there, thank you for reading my blog in 2014 and I hope you'll stick around with me in 2015.